Following US President Donald Trump’s tweet that used a "Game of Thrones" meme to warn Iran about new sanctions, keyboard-happy Iranians quickly striked back at both Trump and their own officials. A poster featuring the Commander of IRGC’s elite Quds Force Qasem Soleimani, in the style of the hit HBO show "Game of Thrones." Posted Nov. 3, 2018. “Sanctions are coming November 5,” US President Donald Trump tweeted Nov. 2, ominously warning Iran on the sanctions Washington would reinstate on the country. 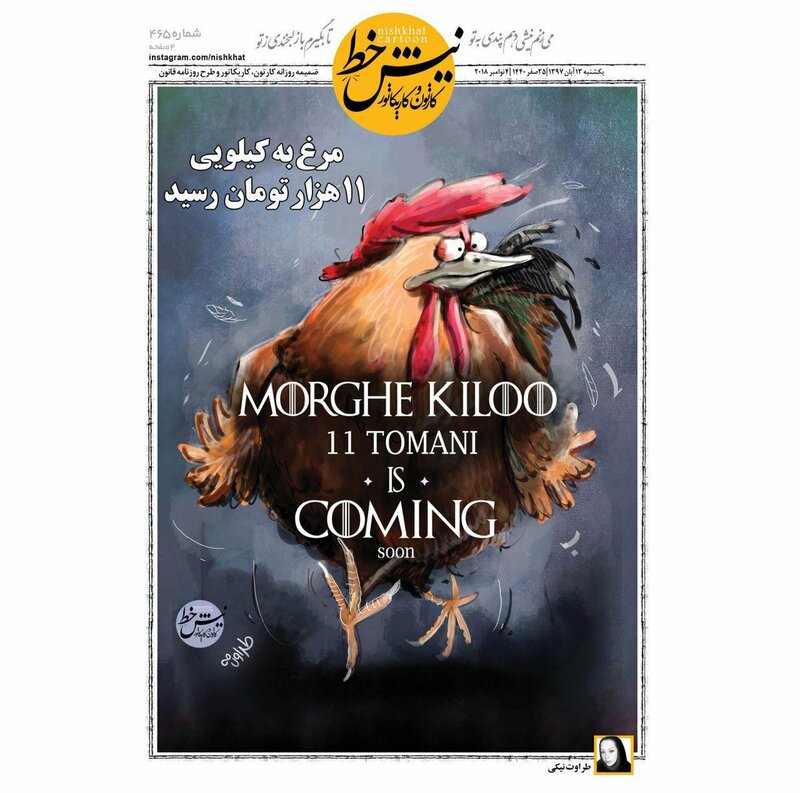 Both the typeface and the message were borrowed from “Game of Thrones,” a fantasy drama TV series popular both in the United States and in Iran. The meme shows the US president gazing into space against a steel gray backdrop reminiscent of the series' visuals. Trump’s tweet immediately drew negative reactions, both for his parallelism between the sanctions and the series’ much-feared “endless winter,” and the implicit casting of himself and his administration in the role of the “White Walkers,” an ancient race of humanoid ice creatures that invade the Kingdoms of Westeros to subdue its residents. The latter part refers to Operation Eagle Claw in 1980 that aimed to release 52 remaining American hostages. But the mission did not go as planned when an unexpected sandstorm grounded American helicopters and troops in the central desert of Tabas. Another "Game of Thrones"-inspired image was published on the Instagram page of Qasem Soleimani, the commander of the IRGC’s elite Quds Force: “I will stand against you.” It came with a note in Farsi that read, “Trump the gambler, I am your opponent." The memes kept coming with parodies of Iranian political figures. The Twitter account of Vox Pop showed parliament Speaker Ali Larijani sitting on the Iron Throne, saying “It is the family name that lives on.” This was a thinly-veiled reference to the parliament speaker’s influential family. Larijani is the son-in-law of one of the Islamic Revolution’s ideologues, Ayatollah Morteza Motahhari. His brother Sadegh Larijani is the head of the judiciary; another brother, Mohammad Javad, is a former diplomat and president of Iran’s Human Rights Committee; and the youngest brother, Mohammad Bagher, is deputy minister of health and medical education. This meme got a lot of attention and reposts because it came amid signals that the Reformists are likely to throw their weight behind Ali Larijani in his 2021 presidential bid. Vox Pop posted another meme portraying chairman of the Guardian Council of the Constitution, Ayatollah Ahmad Jannati, talking to the legendary dragons in the series: “I have read the FTFF TFTA FAFT FATF In Dothraki.” Dothraki is the fictional language of Westeros. The meme poked fun at Jannati’s advanced age and the controversial debate surrounding the ratification of anti-money laundering laws and FATA legislation at the council and the parliament. Humor has a strong place in the rich Persian literature, ranging from 14th century poet and satirist Ubayd Zakani to 20th century satirists such as Ali-Akbar Dehkhoda and Mohammad-Ali Jamalzadeh. Internationally known Towfigh Magazine kept up its satirical news for half a century, between 1922 and 1971. The Islamic Revolution in 1979 and the Iran-Iraq War put a decade of silence on political satire until 1990 when journalist Kyoumars Saberi published the first volume of his weekly Gol-Agha. For two decades, Gol-Agha used cartoons and short articles to make fun of politicians and bureaucrats. It tread a delicate path, however, and never targeted clerics and presidents.